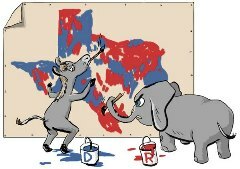 Much has been written about Texas politics and our current redistricting fiasco causing delays and confusion in the 2012 primary elections. While doing some research on this matter, I came across an article with a very interesting slant on the issue. The following article is posted in its entirity with permission from Texas Grizzlette author Katie Thompson. It is a melancholy object to those who drive through this great state to see signs on every roadside emblazoned with names and slogans of candidates for this, that, and the other office. It is not the signs that are troublesome, but the multitude of fine men and women so qualified and eager to serve their fellow citizens being forced into a small volume of elected positions. I think it is agreed by all parties that this prodigious number of candidates is, particularly due to the growing population of the state of Texas, a very great detriment to the political system. Quite simply, we possess too many admirable politicians and too few districts in which to elect them. But my intention is very far from being confined to provide only for these politicians who struggle so to gain elected positions; it is of a much greater extent, and shall extend to all Texans and, indeed, all Americans. The plan proposed herein will give Texans a much greater power and satisfaction in their government. As to my own part, having turned my thoughts for months upon this important subject, and maturely weighed the several schemes of other projectors, I have found the current congressional maps grossly insufficient. Take, for example, congressional district 25. How is one to choose between Michael Williams, Wesley Riddle, Dianne Costa, Brian Matthews, and the many other fine patriots battling tooth and nail for this singular position? On the Democratic side of the aisle, what of Lloyd Doggett and Joaquin Castro? In some races, such as Senator Hutchison’s open seat, some candidates have even been forced to cease their candidacy and seek lower offices in order to secure a political future. It is a distressing predicament. I shall now therefore humbly propose my own thoughts, which I hope will not be liable to the least objection, to public consideration. The state of Texas must expand, returning at the very least to its original 1836 borders, so that more congressional and senatorial districts may be formed to accommodate our cornucopia of admirable and accomplished political candidates. Texas could easily gain tens of seats in both the state and national legislatures, as well as electoral college votes, bolstering its influence in American politics. But extending our borders would provide numerous benefits in addition to ensuring worthy candidates may acquire the positions they deserve. Firstly, it would allow more room for an already booming population to continue growth. Secondly, it would allow Texas to extend its empire of job-creation. With over one million jobs created between 2001 and 2011 alone – more than any other state in the nation – with our current borders, one can hardly imagine the possibilities when land and businesses from adjoining states are acquired. With this added job-creating capacity, Texas could continue expanding its economy and dominance in the global job market. Thirdly, it would greatly increase the state’s taxpayer base, providing more funds for worthy projects that will help create a more comfortable and civilized society. Fourthly, it would give the state additional military bases, increased forces, and dominance during wartime. Fifthly, it would give the state more power in the education industry, allowing Texas to further its ultra-conservative brainwashing agenda, which includes, to name a few of my favorite components, militant Christianization, Reaganomical indoctrination, and complete denial of both science and the existence of Thomas Jefferson. Sixthly, it would provide the state a plethora of additional natural resources, growing both power in the energy industry and, again, job-creating potential. All of these most agreeable advantages would ensure Texas can continue to accumulate wealth, resources, and political power, leading, of course, to eventual secession and takeover of the American – nay, the entire Western – realm. I can think of no one objection that will possibly be raised against this proposal. I profess, in the sincerity of my heart, that I have not the least personal interest in endeavoring to promote this necessary work, having no other motive than the public good of my country and fellow Texans. P.S. For those of you who have never read Jonathan Swift’s “A Modest Proposal,” have trouble detecting sarcasm, or live in Oklahoma Occupied North Texas and can’t take a joke, this is satire. Texas could exercise her option under the Annexation treaty to divide into 5 states. Texas would encompass Waco - Austin - San Antonio and surrounding areas. South Texas would be Laredo - RGV - Corpus. West Texas would be the Panhandle to El Paso. East Texas would include Houston and east Texas. North Texas the Metroplex and surrounding counties. The result would likely be 8 Republican Senators and 2 Democrats.